Tail Rot can be suspected when the tips and leading edges of fins become ragged. Tail rot disease or fin rot as it is also known is a bacterial condition. If left untreated, it will gradually move inwards towards the base of the fin. If it gets into the caudal peduncle, as has happened in the image below, the fish may not recover. At best, it may recover but the tail fin doesn’t grow back. The bacteria that cause tail or fin rot are always present in an established aquarium or pond. 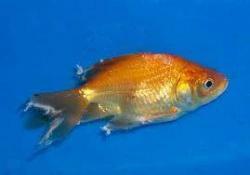 Tail rot, as the name implies, mainly affects the caudal fin but in severe cases can affect other fins, especially in long finned goldfish varieties. 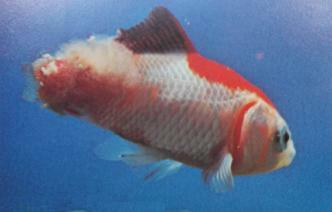 The cause of tail rot is simply a fish that is in very poor health, allowing bacteria to get a foothold. Long periods of sub 60oF water temperatures can be a factor. If the fish has been in low temperatures for some time, slowly raise the temperate into the mid or high 60s. If water temperatures are normal, then improper feeding or water conditions will be the cause. Move the goldfish into the sickbay and a mild salt bath of two teaspoons of non-iodized salt per gallon. Trim back the damaged portion of fin if the damage is severe and is hindering the fish from swimming. Use a razor blade or a pair of sharp scissors. Paint the remaining fin area with 5% Methylene blue in solution. Another option is bathing the fish in 250 milligrams of Tetracycline per gallon each day for a week, leaving the fish in the solution all day. Let the fish recover overnight in a mild salt bath. Another popular and effective antibacterial treatment is API Melafix Antibacterial Fish Remedy . The active ingredient is Melaleuca which is harmless to aquarium plants and is claimed not to adversely affect the biological filter. Some fish keepers treat the affected fish in their own aquarium, but if that is where the condition developed, it isn't going to be the ideal place to treat the fish unless it is completely stripped down and sterilized. The smaller 8 fluid OZ (237 ml) bottle treats 470 US gallons so some of the larger sizes available make it possible to treat a large pond. Leave the fish in the sickbay until you see growth starting along the leading edge of affected fins. Feed it plenty of live foods to speed up recovery. If a large portion of the caudal fin was affected, requiring most of it to be removed, it can take up to a year or more for the tail to grow back. If only the free edges were affected repair will be rapid.